Judy and Nick in my Electric Hearts robotic style. I think this one turned out nicely, and familiar characters helps people to understand how I design certain details in a robotic fashion. The Current version of Freedom Planet 2 girls. You can see them in the demo’s character select screen. They look very different than what was in FP2 announcement. I wasn’t sure about the initial art style (which was also my work), so I had been doing art experiment on twitter. Thanks to the fans’ feedback and FP developer Stephen’s openness to change, the improvement was made possible. Kiki the Cyber Squirrel, the mascot of Krita. If there is anything I can be proud of myself, the first thing is gotta be designing mascots for free and open-source software projects, for free! Kiki is a lucky girl, she has been loved by so many! Concept artist, character designer. Draws mostly anthropomorphic / robotic animals. * Anthropomorphic animal works only. * For personal use, commission / request is CLOSED at the moment. Ohmygosh! I saw a pic on the Krita loading screen by you and I was like "I know that style!" haha awesome art, keep creating! 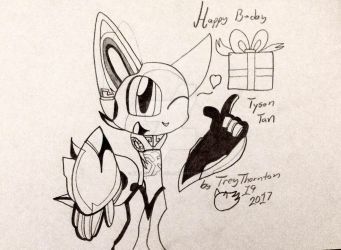 wow :0 your art is adorable! Good news I've got it working now, thanks 4 the info Tan! Oh cool, you're the person who drew the amazing artwork for Freedom Planet 2. Keep up the good work!